I once endured a sales interview to help out a friend’s son who had just started a job in life insurance sales. I told the young man that I would not be a good prospect for him because I had all the life insurance I needed. He responded that the interview would be good practice for him, so I agreed to do it. Do you know who the Arnold Schwarzenegger is? Do you know who he is married to? Did you know that they have children? Do you know who their children’s great grandfather is? His point; I knew of Joe Kennedy because he provided very well for his children and their children but he was wrong. I knew of him because of media coverage, after all he is the father of a president and two senators, and at one time, he was one of the richest men in the country. The manager was trying to coerce me into buying life insurance, specifically whole life insurance. He was trying to convince me that life insurance with a savings component is a good way to invest and of course, it is not. After finishing college, getting established in a career, and having a family, you are going to be faced with choices regarding life insurance. The company you work for may provide you with a small amount of insurance-usually enough to cover a funeral-and if you want to purchase more, they may offer a selection of group term life insurance plans for you to choose from. At some point you will be approach by someone-outside of your company-selling life insurance and when it happens, it is imperative that you know what to buy and why you’re buying it. Don’t be confused about the purpose for having life insurance. Life insurance is a risk management tool that provides financial protection for those who depend on you financially, if you die. You should save and invest elsewhere. Most of us want to leave wealth to those we love and a portfolio of good investments is a better way to do it. Life insurance is a necessary ingredient in your financial plan especially when others depend on your income. It provides them with protection from financial hardship should you die. 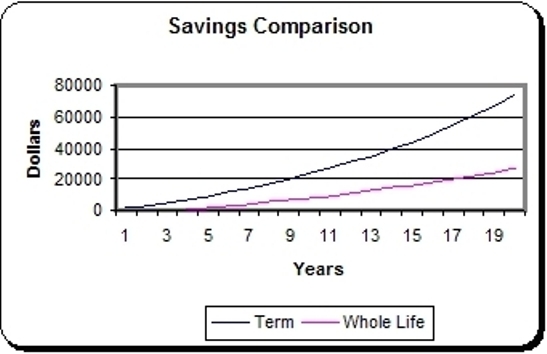 There are two basic types of life insurance policies that are sold most often; term life and whole life insurance. 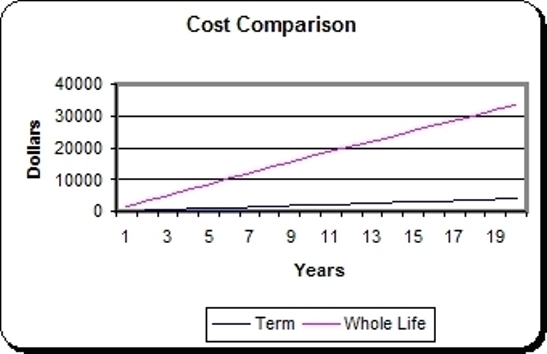 Term life insurance as the name implies provides coverage for a specific period of time. It can be 5, 10, and 15 years or more. During the period, you pay a regular fixed premium to an insurance company. When the period ends the coverage ends. Whole life insurance is permanent insurance with a savings feature included. It is paid for over a specified period of time and it accrues a cash value (savings component) that the insured can access or use to pay future premiums. It is complex and expensive and in my opinion most people would be better off buying term insurance and investing the difference in a mutual fund. Consider this hypothetical situation. Xavier is 37 years old, a non-smoker, and in good health. He gets quotes for the face value of $100,000 for a term policy and a whole life policy. The term policy has a 20 year fixed premium of$200 per year and the whole life policy has a monthly premium of $144 for the first 10 year period and $134 per month for second 10 year period. After 20 years this is what happens. The total cost for the term policy over a 20 year period is $4000 versus $33,360 for the whole life policy. As you can see the term policy cost less and the investment returns are greater-at the end of the 20 year period-than the cost and cash value in the whole life policy. Furthermore if Xavier died on 364th day of the 19th year, his beneficiary would receive the face value of the term insurance policy and would keep the $73,442 saved outside of the policy. Conversely the whole life insurance beneficiary would only receive the face value of the policy and none of the cash value because if it had not already been accessed, it stays with the insurer. Which is better, $173,442 or $100,000? If you’re single with no dependents, you probably have enough life insurance with the nominal coverage your employer gives you as a fringe benefit. If you have a family or love ones who depend on you financially, you need to be covered with at least ten times your annual pay; you should buy 20 year fixed term insurance, buy it outside of your employer, and get quotes from different insurers. Buying term insurance and investing the difference is the smart thing to do. 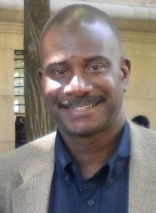 By Donell Edwards in Investing, Money Management, Uncategorized on November 29, 2013 .